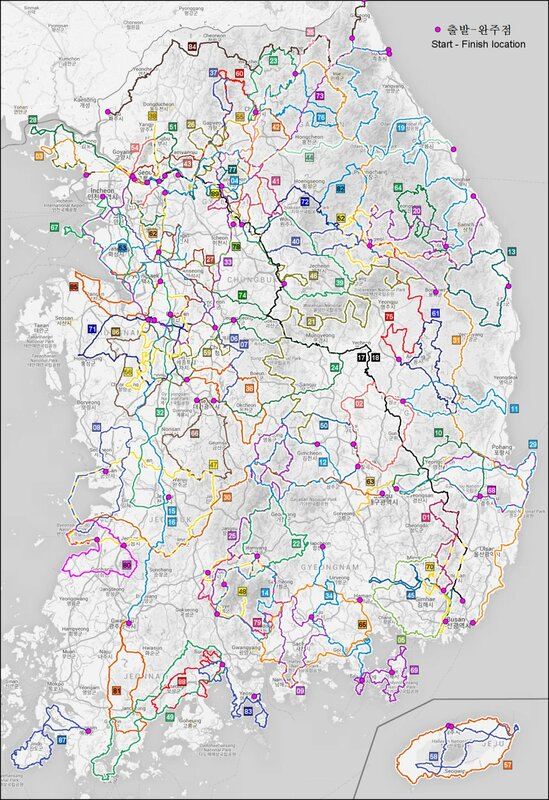 There is a special randonnee called the "Baekdudaegan Challenge", which combines 4 permanents (PT-19, PT-20, PT-21 and PT-25) into one, with a length of 1760 km. The course is extremely mountainous, the total of climbing meters exceeds 40,000m. The four stages can be done separately but must all have been successfully finished within one year. There is a special certificate for this longest and toughest cycling marathon. Only a few members have ever achieved this monster marathon, see the Honor Roll. Permanents in the adventure series are hard, using small roads in remote countryside and show the most beautiful scenery of the country. Riders must have a good condition and must be well prepared. Take care of safety at all time. If the weather condition is not good, especially after rain or snow, riding can be difficult. Please be careful of small pebbles, sand, and fallen leaves on the road. Be sure to prepare cleat-covers, etc. Carbon wheelsets with rim-breaks are not recommended. After completing the whole series (no date limit), the winner gets a special certificate and will be listed in the 'Honor Roll' on the Korea Randonneurs website. The following permanents are part of the adventure series: PT-46, PT-64, PT-75, PT-76, PT-77, PT-79.